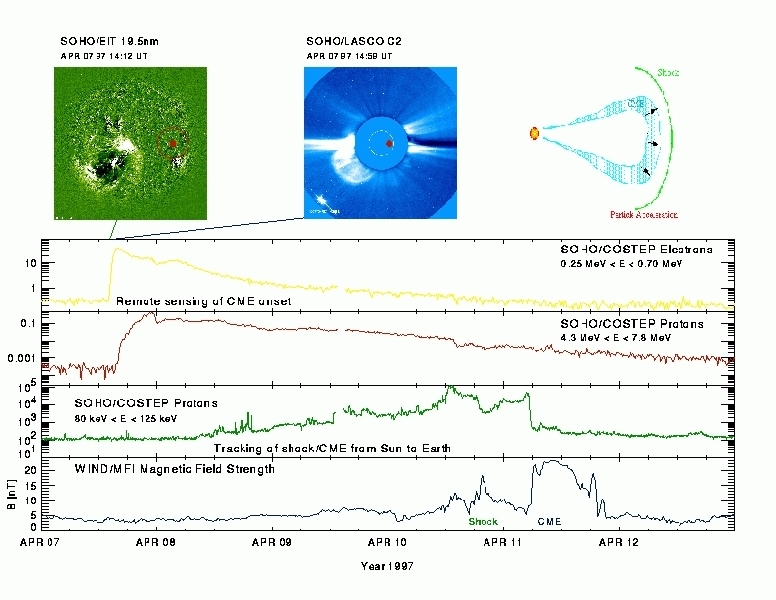 SOHO/EIT/LASCO/COSTEP EUV, white-light, electron and proton observations for the onset phase of the particle/CME event on April 7, 1997. The EIT running difference images taken at 195 A show a shock (Moreton-like) wave in the south-eastern portion of the lower corona which was running across the solar disk at speeds of several hundred km/s. The LASCO observations show the halo CME associated with the shock wave. 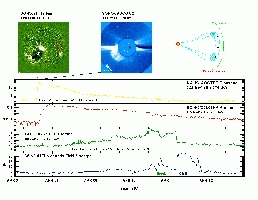 The times of the individual LASCO/EIT images are marked in the intensity-time profiles of 0.25-0.7 MeV electrons and 4.3-7.8 MeV protons (time resolution 1 min. ).